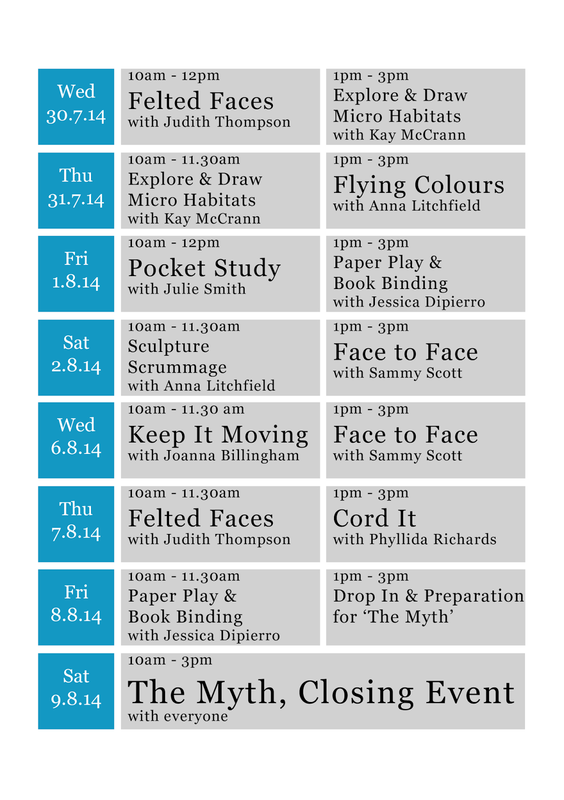 Why not Sign up to one of the Many Workshops being held in the Gallery between 30.7 - 9.8.14? 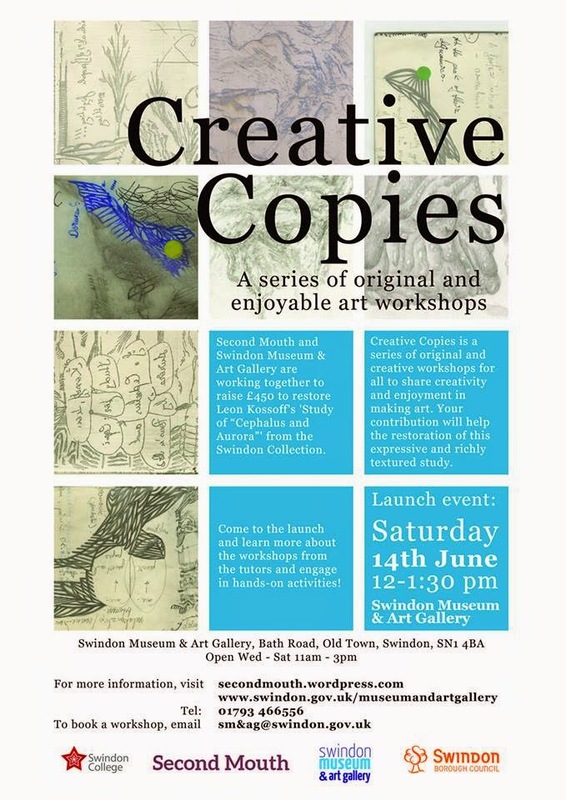 Artist collective Second Mouth and Swindon Museum & Art Gallery are working together to bring you Creative Copies, a series of fun and original art workshops taking place in the gallery this summer. 'Through the workshops we hope to raise £450 to restore ‘Study for Cephalus and Aurora’ by British artist Leon Kossoff for the Swindon Collection of modern art. This small and richly textured study has been unseen for many years and is in need of restoration before it can be publicly displayed again. · and to re-fit the painting in the newly cleaned frame. We would love you to be involved in this project, and we are sure there is a workshop for you! You can support us by booking a place on your favourite workshop directly from the museum, and telling all your friends about this exciting project. Places on the workshops cost just £5 per person and are open to all ages. We really appreciate your support, and we hope to see you there! Hope to see you at one of the workshops. It's been a while since there have been lunchtime talks, so this one was eagerly awaited, would there be a crowd in to listen to Sophie Cummings talk about the current exhibition of portraits - About Face? I thought it would be a popular time of day, there were others who thought not, in fact more than 40 people attended the talk, and seemed very happy with the talk and the timing. And another shot of the audience, and doesn't the gallery look superb with that colour on the walls? Sophie talked about the history of the art collection which now amounts to about 470 works, mentioning the importance of Lord Methuen who encouraged Swindon to have an art gallery followed by Jimmy Bomford who lent and then donated 21 art works initially and then more later after being given a bottle of champagne by Denys Hodson. Aided by Richard Morphet, Denys was able to add to the collection so we had an 'open ended network of connections'. Sophie then moved on to considering the history of portraiture, before photography, it was an important way of depicting a person, although only available to a few because of the cost of it. With the advent of photography, portraiture continued to be popular because it captures the essence of a person suggested Sophie. It's 'Seated Figure' 1927 in crayon, ink and green wash on paper, and it was donated by HJP Bomford in 1946. Sophie gave a very interesting talk from a personal perspective which did what I think such talks are intended to do, made the exhibition more accessible. With 3 changes of exhibition per annum, we may have more of these talks, it's certainly worth looking out for them and coming along.